Color-consistent appearance on monitors is determined by a variety of influences. There is firstly to mention the system configuration consisting of monitor type, calibration software and measuring device. On the other hand there are to consider the ambient conditions of the workplace such as impacts of ambient light, colour of walls close to the workplace as well as the clothes of the operator. A periodical and validated monitor calibration is another important factor. 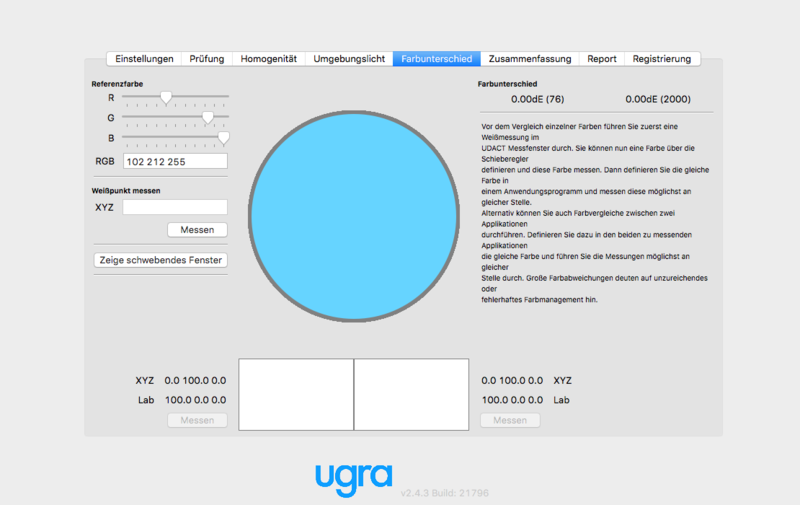 Using Ugra CertifyDisplay you can precisly analyse and verify your monitor display calibration. 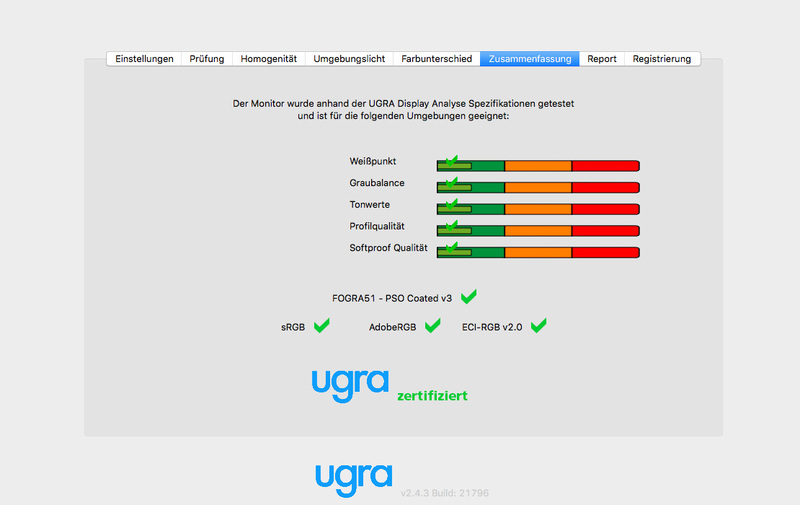 If the test results in «Ugra-certified», then you see colours correctly. A wide gamut test as well as additional test pattern for visual assessment complete the main test procedure. The summary report shows the detailed test result an can be saves as PDF document. 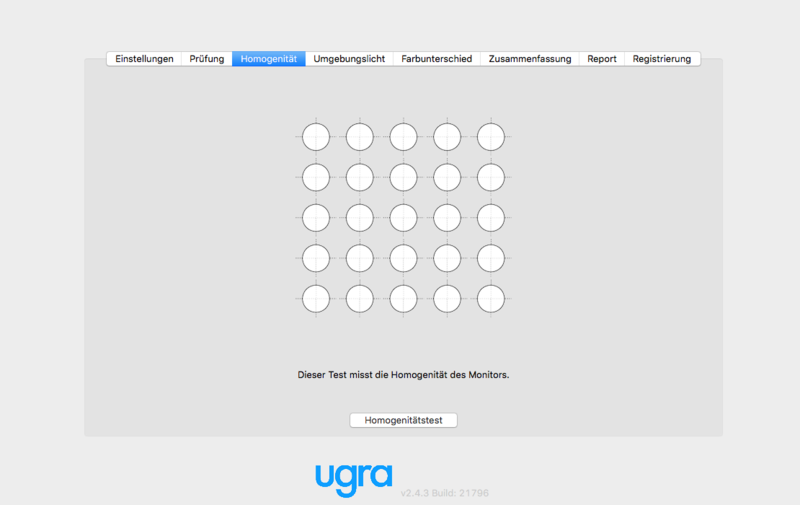 The uniformity test (homogeneity) determines the luminance and colour deviation of the monitor. According to the ISO 14861 standard this test is performed by means of 25 measuring patches (9 ones acc. to ISO 12646), starting from the center as a point of reference towards the surrounding measuring patches. The deviation of the luminance shall not exceed 10%. By using the feature ambient light the surrounding illumination (luminance in Lux, colour temperature in Kelvin) of the monitor can be measured. If the monitor is calibrated e.g. with a lightness of 120 cd/m², the ambient light should not exceed a luminance of 100 Lux. Be aware of disturbing light sources surrounding the workplace (room lighting should be appropriate to D50 illuminant) and make sure walls are painted with neutral colour and furniture is non-reflecting. A correct calibrated monitor does not assure, that different software such as Adobe Photoshop displays colour correctly. To check, if color management works correctly, you can measure and compare a tint across applications. 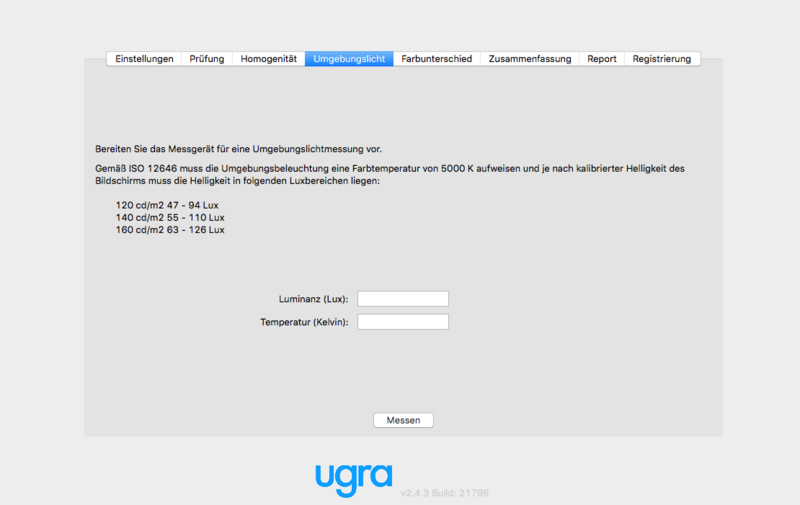 First you capture a tint within Ugra CertifyDisplay, afterwards you define the same tint e.g. in Photoshop and capture it again. 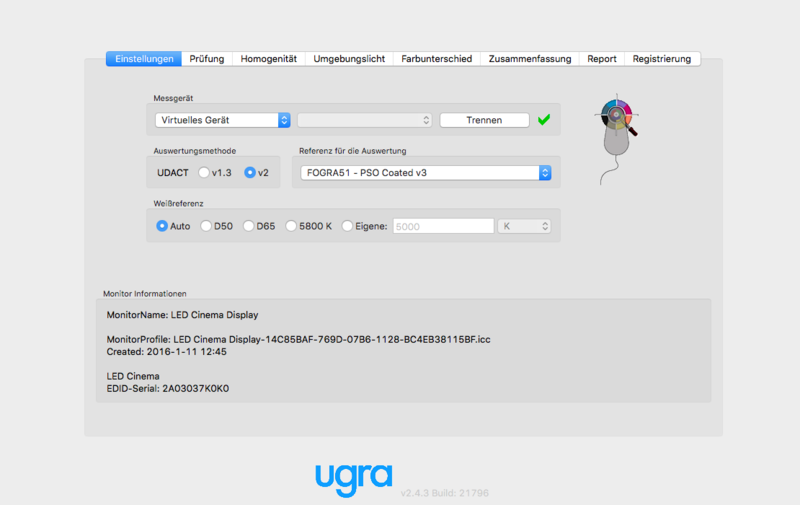 Ugra CertifyDisplay displays both colours side by side and shows the tristimulus values in XYZ and CIELAB as well as the colour difference ∆E. If the colours appears almost identical, the monitor is correctly calibrated and color management in Photoshop is well adjusted. We are looking forward to advise you! Call us under +41 71 552 02 40. How do I get the demo license? We will send you an email with the demo license attached, after your order is completed. How do I register the demo license? Open the software and click on the tab "Register". Click then on the button "Load…" and choose the license file on your local computer. If the license is valid, the serial number and the expiring date is displayed. How do I change the software language? The language is automatically located by recognizing the one of the operating system. To switch to another language of the software, you need to change the language setting of the operating system.